Anodic Oxidation of Aluminium and Its Alloys focuses on the basic principles of anodic oxidation, choice of materials, pretreatment, design, properties of the anodic film, testing, and maintenance. Organized into 16 chapters, this book begins with the principles of anodizing; applications of anodized aluminum; factors influencing the choice of grade of aluminum for anodizing; and factors influencing the choice of anodizing process. Subsequent chapters explain designing for anodizing; anodizing equipment; jigging (racking) methods for anodizing; chemical treatment processes before anodizing; and the anodizing process. The coloring, sealing, and stripping of the anodic coating; testing anodized aluminum; properties of anodized aluminum; maintenance of anodized aluminum; and effluent treatment for anodizing plants are also described. 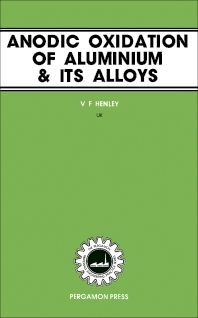 This text will be useful to students, technicians, product designers, architects, and engineers in the aluminum industry.